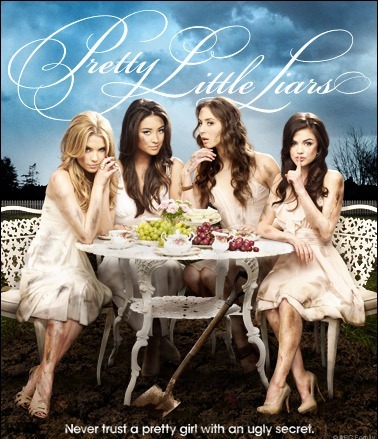 Although I don't regularly watch Pretty Little Liars, I do find the concept behind the show intriguing. So, when I had the chance to speak with Troian Bellisario, who plays Spencer Hastings on the show, I was happy to get a little more insight into the show. There were some wonderful questions and I learned a lot in just half an hour. Some of the most intriguing things I found out are included below. - Troian's nicknames range from T-Rizzle to T-Bone, T-Bird, T-Rex, anything with T.
- Troian comes from a family who works in show business. (You may be familiar with her father, Donald Bellisario, producer and screenwriter who has worked on shows such as Magnum PI, Quantum Leap, JAG, NCIS. Her mother and several siblings are actors.) When she went to her parents and told them that she wanted to act, they asked her to see if there was anything else in the world she would do instead. - In a fantasy world, Troian would be a rock star. When she was younger, she had a "very intense obsession with death" and was fascinated by forensic scientists and morticians. She had a "draw to work with the dead." - Troian hasn't had cable in five years, but really enjoyed watching Six Feet Under on DVD. She also is trying to follow Game of Thrones because she read the pilot and auditioned for it and fell in love with it. She prefers movies instead, because of the containment. - Troian started teaching herself guitar a little while ago. She enjoys playing Bright Eyes, Elliott Smith, Arcade Fire, and The White Stripes. - When she has free time on the set, Troian likes to sleep, write, and work on other projects. - Troian does not know who A is. She says that the writers are keeping their options as open as possible. - Both Troian and Spencer are studious and put a lot of pressure on themselves to succeed. We see Spencer's uptight and focused attitude on the show, and Troian said that she was valedictorian of her class, she "felt that [she] had to be the best and the brightest at everything otherwise [she] wasn't worth anything." One big difference is that Troian has learned to re-evaluate her priorities and Spencer has not yet had the life experience necessary to see that need. If Troian was to describe Spencer's superpower, she'd say it was her intellect. - When asked what her favorite wardrobe piece has been, Troian pointed out that, she'll have a favorite piece, but by the time she's done wearing it (seven days straight for fourteen hours each day), she just wants to get it off and burn it. She does think that there are some awesome outfits coming up, and that the clothes are adorable and really insane. - My own question to Troian focused on how she enjoys a regular lead role in comparison to the the movies, theatre, and small TV guest roles she did in the past. Doing Pretty Little Liars has really taught her how to carry on and be a professional. Working on something ten months of the year means you aren't always feeling great, and you have to be tough and keep up a good morale. A lot of people "have a lot of ideas about how glamorous it all is and how fun it all is" but you just have to make sure that you're doing your best job for the show. Thanks to ABCFamily for inviting TheTalkingBox to be part of this Q&A!